Hey there!! Just filling in for a day this month, and wanted to share a fun little card I created last week using the "Love Games" collection!! 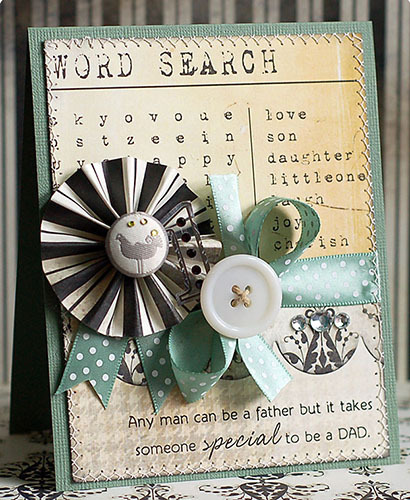 I adore the Paper Layers that Glitz Design comes up with every release, and this one with the word search theme couldn't have been more perfect for my card! All the on the right link to parenthood, and this card is all about celebrating dads!! Other supplies: Bazzill Basics cardstock, Renaissance by Design ribbon, Papertrey Ink button & scalloped die, My Favorite Things stamps, Tsukineko ink, K & Company brad, International Greetings USA jewels, & Cuttlebug diecut machine. Love that card... absolutely beautiful!